GDS3 Booster Pack Challenge: But for Cardsmiths! Alright so if any of you followed GDS3 you would know that they had to make a booster pack of custom cards as a challenge. I wish for you to do the same. - The pack may be based off of a plane, if you so choose; but the cards in the pack must be connected in some way. Because the are all supposed to be from the same "set"
or you may make them all. - YOU MAY NOT SWITCH STYLES OF CARD MAKING MID PACK!!!! - Each judge will judge each pack and we will decide winners at the end...! - YOU MAY NOT START SUBMITTING UNTIL SEPTEMBER 1ST! Booster packs, at least since Shards of Alara onwards, only had ten commons, three uncommons, one rare/mythic, one land, and ~ 1 token. So we pick packs and then we make a hypothetical pack for it using cards that we make for that set’s concepts? I didn't want to re-invent the wheel at common since there were 10 of them to design, so I mostly wanted to showcase a bit of every archetype, highlighting the specificities of the Aether Revolt set from a design point of view, and developing the spirit of the set in slightly new directions but nothing too fancy. I then tried to do some new things at higher rarities. Aether Revolt distinguishes itself from Kaladesh by its more destructive nature, highlighted by the Revolt mechanic. 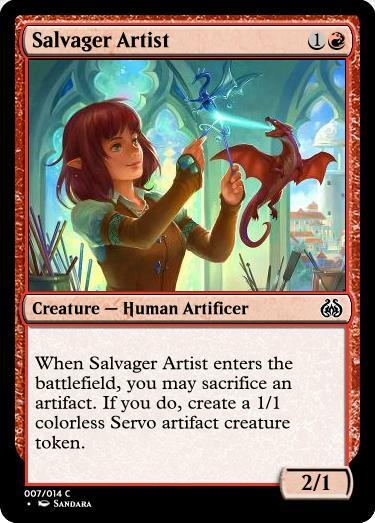 It also needs a way to create Servo tokens now that Fabricate is gone. While Red is not in the colours of either Revolt or Fabricate, it likes to sacrfice artifacts for value, and this plays in this area. 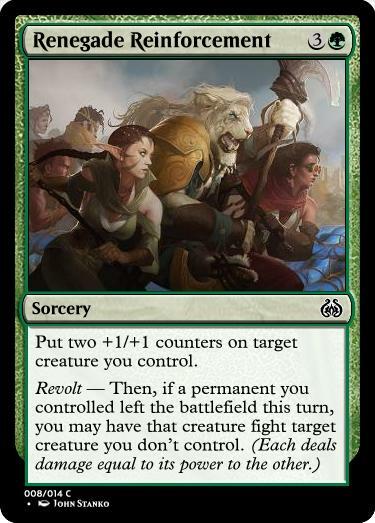 A simple fight spell that showcase the set's new mechanic that appears in green: Revolt. It has utility in any limited green deck but plays especially well in both the GW Revolt archetype and the BG +1/+1 counters matter archetype. The artifact-matters theme is stronger in Aether Revolt than in Kaladesh and the Revolt mechanic asks for some sacrifices. The set is always in need for more artifact creatures with coloured activation costs. This one is fitted for both the UB Artifacts-matter and BR Artifact Aggro archetype but plays especially well with the WB Revolt/Sacrifice/Reanimation archetype which likes to reanimate stuff from the graveyard. There's also a light mill theme in Aether Revolt. 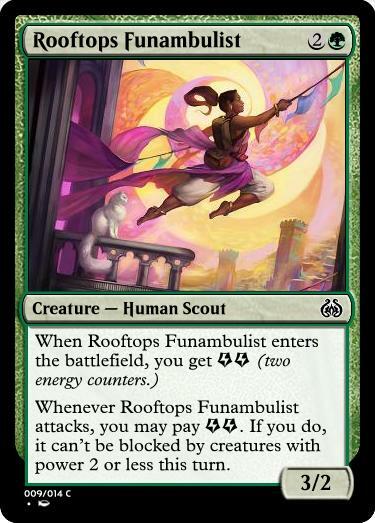 Top-down design from a story moment, this card is a utility spell that will shine mostly in aggro WR Vehicles decks because it can untap the crewing creatures. This cards showcases the new mechanic Improvise. 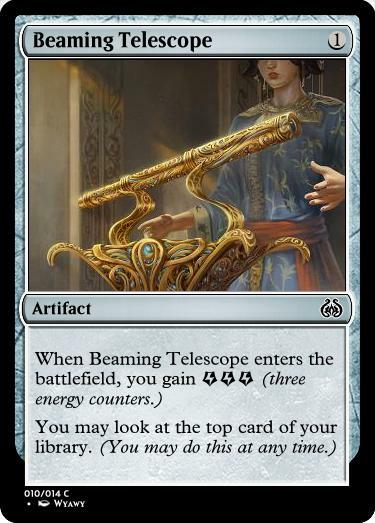 It goes straight in the UR Improvise deck where it can untap the artifacts you used to improvise, but it also goes well in the WU Blink deck that will like blinking this to tap the opponent's creatures. A subtle variation on Innocent Blood that is reminiscent of the old and flavourful Terror-like black removal spells (destroy target nonblack nonartifact cards.) This one goes especially well in UB Artifact-matters of UR Aggro Artifacts archetype since it can become a one-mana "Target player sacrifices a creature" as long as you have only artifact creatures. WOTC claimed a posteriori that they should have put Energy hate cards in Kaladesh to keep the set from spiraling out of control like it did. 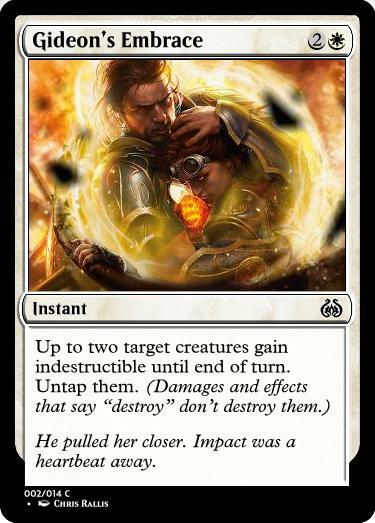 This is one card attempting that in a very direct way that is not as brutal as Suncleanser. A low-mana artifact card. It's pretty straight-forward, and goes into any limited deck that is desperate for either energy or artifacts. This card returns the main mechanic of the Kaladesh block, Energy, and respects the convention where every card using energy provides some itself. It also highlights how WOTC started to push the Daunt mechanic (can't be blocked by creatures with power 2 or less) with the Kaladesh block. It is meant for both the stompy RG Energy and UG Energy value decks. This card plays with both the flavour of Ragavan, the legendary Monkey that's created by Kari zev, Skyship Raider and the Modification Auras. I called this version a Hack and not a Modification because it's a red way of getting rid of a creature. A very dangerous way since the creature gets to attack you once with the boost. This is mostly meant for the RW Vehicles deck and RB Aggro artifacts deck. 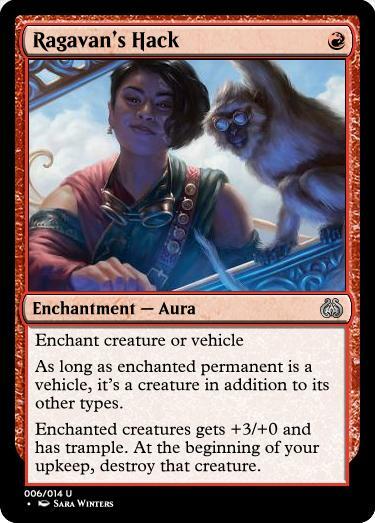 A vehicle and its returning mechanic Crew from the Kaladesh set. I tried to respect the as-fan (=probability of apparition) of both artifacts and vehicles in this booster, and vehicles have a higher chance of appearing at uncommon. 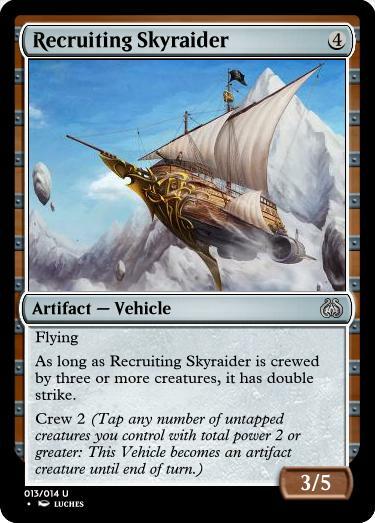 This skyship plays in a yet unexplored area: the vehicle caring about the crewing creatures, instead of the creatures caring about crewing the vehicle. A powerful build-around-me to highlight the Johnny aspect of the set. It pushes the light mill theme of Aether Revolt a little further, and synergizes with both Improvise and any artifact creatures like Vehicles, Servos and Thopters. The Kaladesh Block is meant to be more Johnny-ish than other sets with plenty of very Johnny artifacts. This plays in this area with a unique ability that has many ways of being taken advantage of. Not much to see here, but I managed to find a good-looking illustration with the characteristic swirly clouds of Kaladesh, following the trail of aether. I wanted to showcase this unique feature of the Aether Revolt boosters that are the Inventions Masterpieces. 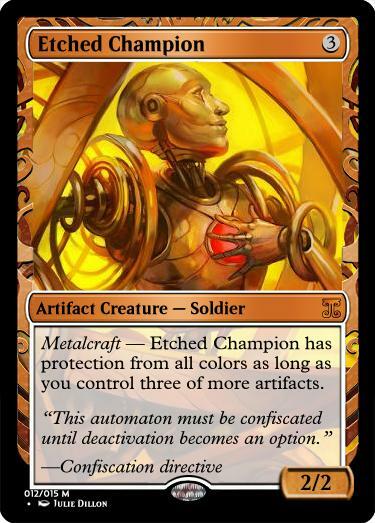 I chose Etched Champions to fit the characteristic bronze-coloured illustration, and added a "Confiscation Directive" flavour text that appear specifically on the Aether Revolt inventions as opposed to the Kaladesh ones. I made my booster on mtg set editor, how do you get that link to post here? @bigbadbooknerd Post them on imgur. Ah, thanks for reminding me. I'll have the entries in tomorrow night. My goal with improving on KTK was to narrow the focus on how many colors players would draft. Many players would play 3 color decks but 4-5 color decks were really just as common and basically free to splash with all the mana fixing and the format being slow as a whole. I targeted several new swaths of design space at rewarding players for playing a specific clan. In draft, these cards would act as rewards for staying in one clan and not just playing 5-color. I also tried to make the cards feel as though they embodied the dragon aspect for each clan (Mardu/Speed, Temur/Savagery, Abzan/Endurance, Jeskai/Cunning, Sultai/Ruthlessness). To sum up my overall goal, I tried to design cards that rewarding playing in a single clan and/or were functional in multiple clans without enabling/incentivizing decks of more than 3 colors. 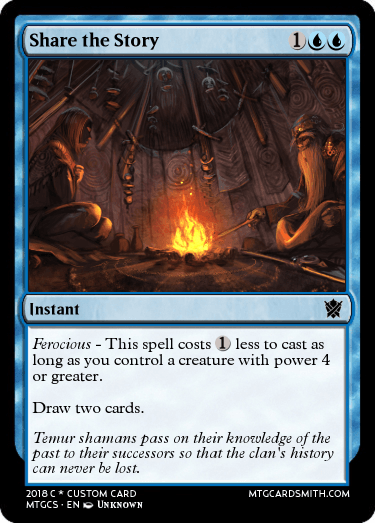 In KTK, blue’s mechanical use of Ferocious was on spells, which I thought was appropriate so I continued with that trend. For this card, I pushed it for constructed at the base level by making it a 1UU instant speed draw 2. Ferocious was used as a cost reducing clause that will have relevance in constructed but not too much in limited. I targeted this card at standard play and perhaps modern play in blue tarmogoyf or death shadow decks while being a mid-level pick in limited. The double U in the mana notably reduces the castability in limited due to MM being significantly harder to obtain than MN in KTK limited which is appropriate for balancing its power level. This card was meant as a limited role player that would be stronger in Jeskai but also playable in Mardu / Abzan. Because the lifelink rider trigger’s off of toughness, in addition to prowess, the runemark cycle in FRF can turn it on, making this a formidable threat. It plays nicely with bolster in FRF as well. 4 mana for a 2/3 prowess seems slightly below rate so this card will not go into every deck, but will have a clear place in the decks that want it. In KTK, there were 0 common equipment, a fact I thought a bit odd. Given how successful jousting lance and even short sword were in DOM limited, I attempted to correct this in KTK by adding a common equipment that encourages aggression at a high cost. KTK had a lot of board stalls due to the prevalence morphs and an abundance of mana sinks, so a card like this can help break through for damage while maintain parity on the board (the creature will still trade). Trample on equipment is powerful, which is why the equip cost is expensive at 3. Because this card can enable attacks that otherwise might have been poor, it plays nicely with Raid and also with Ferocious due to the power boost. Typically, Hexproof at common can cause problems (Jade Guardian in XLN limited), so I upcosted this card to a level where it wouldn’t be problematic, particularly with KTK’s lack of auras / equipment. I intend this to be a common cycle of enemy color morphs. 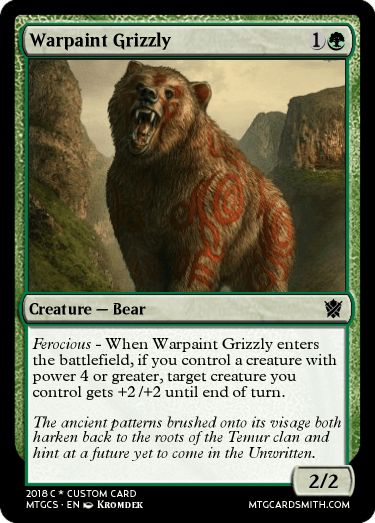 It enables Ferocious in Temur, but is also just a fine morph for Sultai and plays well in the Trail of Mystery / Secret Plans archetype. In contrast to the previous few cards which were designed to fit into several clans, Battlefury Orc plays into my overall goal of creating more clan-specific rewards. This card does that in several ways. 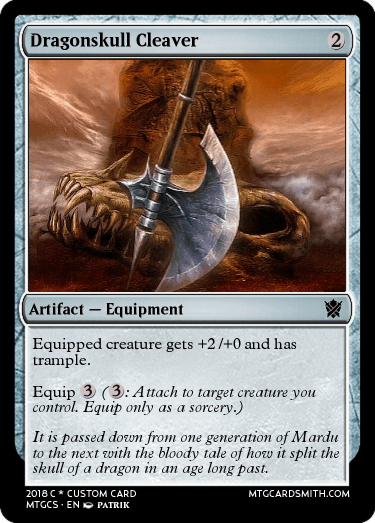 1) The attack trigger ensures that the player needs to be in Mardu. 2) Mardu is more likely to want a 1-mana attacker to enable raid than any other clan. 3)The reward for the card is not high enough that a Jeskai player would include black creatures in their deck just to trigger it. Additionally, a 2/1 first strike plays out as an appropriate reward because it can attack cleanly through one morph but not two. I envision this as a loose cycle of monocolor cards centered in the clan’s (not the wedge’s) central color that care about controlling a creature of the other two colors of that clan. This card was targeted as a weak limited card and also as a mirrored pair to treasure cruise. In modern, it could act as another one mana deal 3, adding an additional reward for playing R/B burn over the stock R/w burn deck. The mana cost in set at 8 so that it is unlikely more than one of these will be cast during a single game. This makes the deckbuilder think about how many to play in such a deck which is interesting and adds nuance to what seems to be a relatively simple card on the surface. In base KTK, there were no common green Ferocious creatures. After struggling with this design for days, I figured out why. Green typically wants bigger creatures, but for a green common creature to have Ferocious it must have base power 3 or less. This significantly reduces the design space. FRF had two (Whisperer of the Wilds and Frontier Mastodon), both of which were extremely well designed. The other issue at common is that the Ferocious effect had to be one-shot to avoid memory issues. Eventually, I settled on this design which I am very happy with. This effect is typically done at 2G, so having Ferocious gives you an undercosted effect. Also, this design gives value to a 1G 2/2 late in the game which is important in KTK since the games often go long. Finally, when you have Ferocious and cast this card, pushing through some damage, it will feel pretty ‘savage’, evoking the dragon aspect that Temur embodies. Rite of the Serpent in base KTK always felt so clunky and a necessary evil since you just needed a destroy effect in black and that was the only unconditional one. To make a better alternative, I made an unconditional removal spell at an aggressive rate but a restrictive mana cost with a downside. Picking your own poison felt classic ruthless Sultai, and the flavor of the Rakshasa’s payment being the torturous choice is perfect. The mill choice plays well with delve but only to a certain extent as choosing it more than once in a game risks milling out. Notably, “sacrifice a creature is not an option because chump blocking and then casting this after blocks would remove the drawback of the card, which is supposed to feel tangible and real. This card is a simple limited C that plays well with Abzan and is fine on its own as a 3 mana 3/2 vigilance. Temur can also use it as it can turn a 3 power creature into a 4 power creature. Overell, this design is functional more than it is anything else. Raid effects at common are limited to sorcery speed in both XLN and KTK. However, making a card with raid that was neither a creature nor a sorcery was quite difficult. With a natural constraint on complexity and memory issues at common, there really are not too many red effects that can be done at common, that don’t effect combat, and would feel unique from previous designs. In the end, I think Torched Outpost has several things going for it. 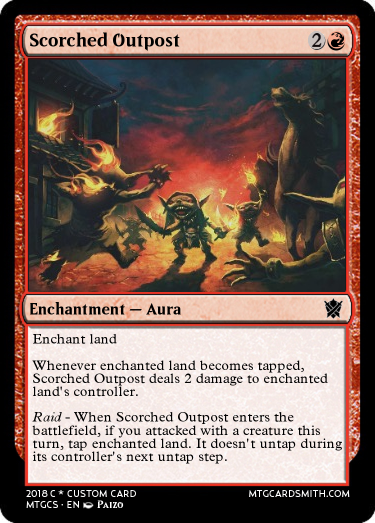 1)It is pushing into relatively unused design space for red (this effect is usually in black but has been in red before as well), 2)It punishes playing too mana colors, and 3)The downside of this type of card is that it is card disadvantage and the rummage effect helps mitigate that fact, particularly in the late game. I also like the tension of wanting to play this early to get the most damage out of it but likely not enabling raid compared to playing it late and likely getting the raid ability but not as much damage. This card represents yet another reward for playing a single clan. You can have a slightly overcosted effect at 5 mana in monocolor or an undercosted effect at 3 mana in tri-color. Like Bloodfury Orc, it target Jeskai specifically by playing well with prowess, feeling ‘cunning’, and not being strong enough to be a windmill slam in a deck that can only cast it for 4U. Additionally, I feel like this design space is particularly promising because it allows the effective as-fan of tri-color cards to increase while maintaining the as-fan of mono-color cards. 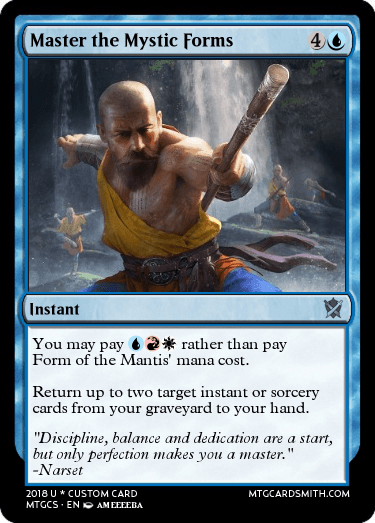 I envision this as another loose cycle of cards (not necessarily just instants) that get discounted if you pay “clan mana” for it. This card is interesting in that it is targeted strongly at both limited and constructed. Because of the memory issue, it can’t be common but isn’t flashy enough for rare, so uncommon feels appropriate. The etb ability is unique in that it doesn’t actually give you one mana of any color, just one mana of a color you already have. In this way, it helps you fix you mana by playing well with the gainlands and tri-lands but not helping you get that fourth or fifth color you are splashing for. 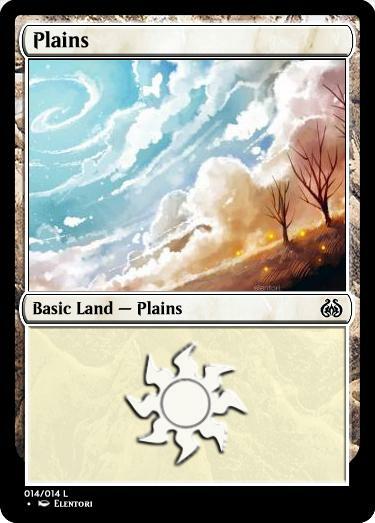 In constructed, this land should be played in a lot of multi-color decks for its flexibility but balanced by the drawback that it does nothing on turn 1 and still only ever taps for one color of mana that you have to lock in when you play it. This card is interesting in that in defensive decks, it can block morphs all day for one mana, trade for morphs at three mana, and eat morphs by unmorphing it and paying the additional cost at five mana. The triggered ability is worded such that the opponent can’t respond to the counters being placed on it (like Megamorph) so it can’t be killed in response when it is smaller. 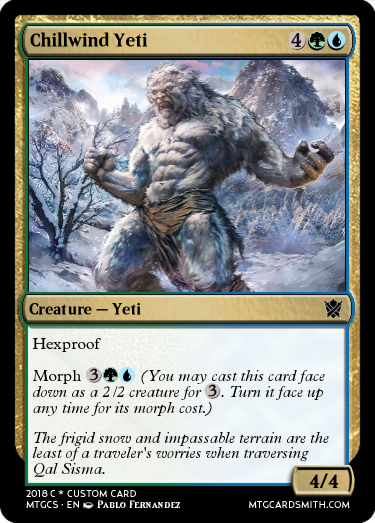 I envision this as a cycle of monocolor cards with a shared naming convention that all trade/bounce off of morphs on the front face and when unmorphed but eat a morph when the additional cost is paid. Wedge ultimatums are the ultimate rewards for strict 3-color clan play, and although they won’t show up in limited much, push that theme in the mind of the drafter just by their existence. The naming convention for this cycle would be “DRAGON ASPECT” Ultimatum and each card would be designed to feel like the pinnacle of that dragon aspect. For this card, the counters both play into the Abzan mechanic of outlast and combo with the sweeper effect to create a semi-plague wind. 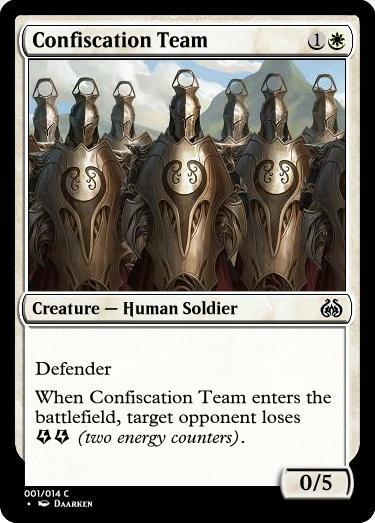 This card feels like the Abzan are using their skills and magic (the counters) to survive where others (those without counters) could not, representing endurance in a fundamental way. 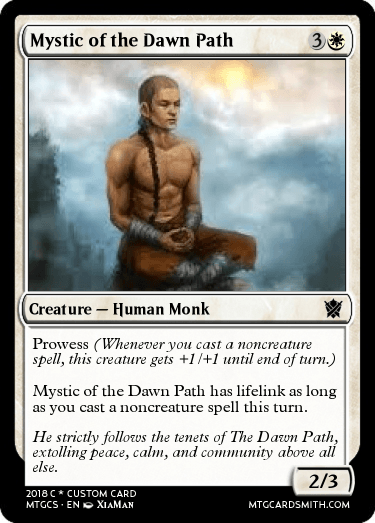 The mana cost is centered in the common enemy color (black) for the wedge rather than the philosophical center of the clan (white) to keep the mana symbol order (WBG) consistent with the rest of the set. Although the card is mechanically centered in white, the difference between an additional white mana versus an additional black mana is so small in practice that I thought it was more important to be symbolically consistent with the set, but it could really go either way. If anyone has any feedback/comments on any of my entries or my overall philosophy, I would love to hear it. First of all, congratulations! \o/ It's an incredibly difficult challenge and you absolutely nailed it. Your pack is really realistic, I can tell you did your research and have a deep understanding of the set as you made a number of choices that were really well-informed (respecting the Morph rules, Ferocious on spells in Blue,...) It really feels like a pack of Khans of Tarkir =D You even made sure to show all colours, all clans, all mechanics, had the proper multicolour ratio, creature ratio, etc. It's great that you identified how Blue was only using Ferocious on noncreature spells, and I really like the flavour of it. 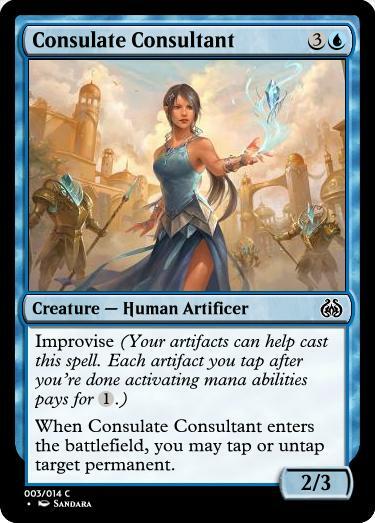 It's a clean concept though I would have considered making it four mana since it's common, making it a better Weave Fate as this version flirts with Uncommon-rarity level of efficacy. It's one of those examples where you used a good concept on a card that I think could have been much more appealing. Putting Prowess on a card that cares about its toughness is a really cool idea. But it basically tells you "CARDNAME gets lifelink as long as you cast two or more noncreature spells this turn" which is a very weak reward for such an interesting but difficult mini-game. I believe you should have gone deeper with something like Arclight Phoenix. If you really mean this card to be played with auras, then I would remove Prowess entirely to avoid misleading players during draft. Once again, I think you stapled a wonderful concept on a card that doesn't deserve it. Getting three creatures of different colours sounds like a fun mini-game which pushes the player in the right direction of playing wedges. But by the time I assemble my triad of creatures, my 2/1 first strike is not that exciting anymore. I wish it was more rewarding. A really clean design, I like how you used the Ferocious ability to really separate the creature part from the spell part on a 2-mana card that will play completely differently in the early or late game. I really like the concept, it's unique and it fits Tarkir pretty well as the set offered a lof of choices. I'm less fan of the execution, I don't think it was necessary to go all the way to three choices for a common, it makes it really wordy. Additionally, the third option is a huge upsides in a deck with Delve, and I don't buy that milling myself is any kind of a risk as I can choose not only to not play the card but also simply to choose another option if I'm near the end of my library. 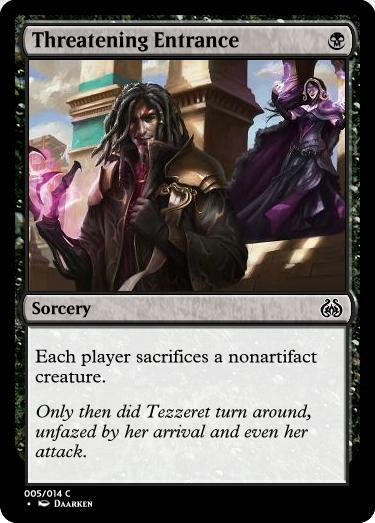 I would have gone with discard a card OR sacrifice a creature and simply make the card a sorcery to prevent the sacrifice of a creature about to die as you were afraid of. 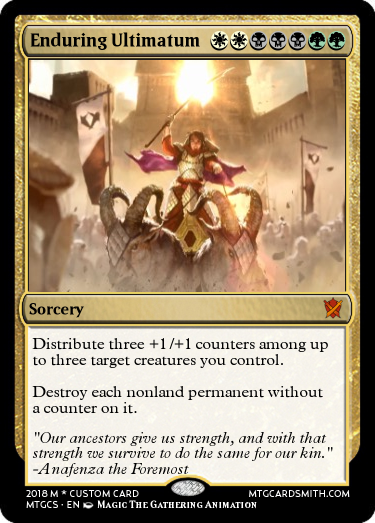 Simple and efficient, I like that you thought of both the +1/+1 counters theme and the Ferocious theme while making it. You definitely took some risks here as it is a very unorthodox land disruption effect. 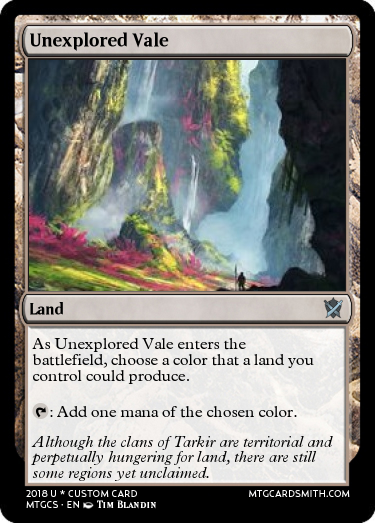 I'm interested in the concept because land disruption was particularly effective in Tarkir Standard though it sounds potentially useless after a few turns. I'm less fan of the Raid trigger, I think it doesn't synergize enough with the rest of the card to the point that it feels weird. It creates three versions of the same vanilla, while only two are really interesting so I can't say I like it. 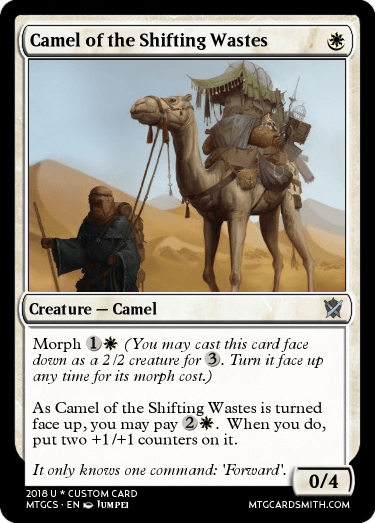 I would rather have a morph cost of 4W with "As CARDNAME is put face-up, put two +1/+1 counters on it" to reduce the weirdness of the two-parts cost, as well as the wordiness. Do I really want to pay just 1W to make my 2/2 into a 0/3 anyways? I think the Ultimatum reference is great, it's a very clever idea to incentivize playing exactly three colours. 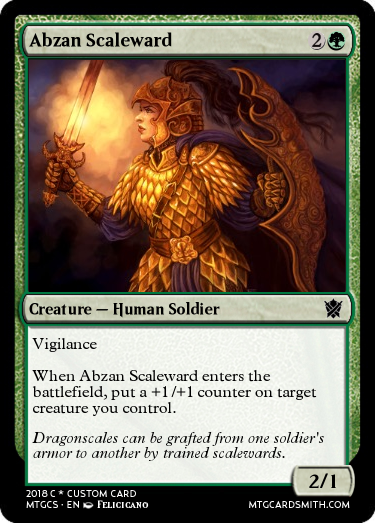 The card itself is realistic, exciting, and plays perfectly with Abzan themes. Thanks a million for the feedback, it really was invaluable and you made some incredibly astute points about the weaknesses in my designs. I made a bunch of changes and here are my comments. I certainly agree that this card is slightly better on rate than what we usually get on common card draw, but in KTK specifically it has a few unique drawbacks. 1) UU is quite difficult to achieve compared to a normal format, 2) with all the taplands, this is not going to be reliably cast on turn 3 like divination was in DOM limited, and 3) Ferocious is likely not going to be online before turn 3 at the earliest, likely turn 4, which means this is most often being cast for 2 mana on turn 5+, where the mana advantage becomes less relevant. I think that at 4 mana it is quite weak and at 3 mana it is on the stronger side but overall it is closer to 3 mana than 4, so I chose to keep it as is. Still, your feedback made me think and I acknowledge that it is definitely borderline. After reading your comments, I realized that in a set that cares about creatures with power 4 or greater, a common should not care about another similar-sounding quality (toughness 5 or greater). As such, I changed the triggered ability to a static one that gives it lifelink if you cast a noncreature spell this turn. I too couldn’t find any specific rule or logic why there wasn’t a common equipment in KTK, but just in case I think I costed my card such that it wouldn’t be oppressive because it is so expensive to equip. This was a really great point that you made and once I read it, I realized that MaRo had literally said the exact same thing to a ton of GDS3 contestants. Thanks for the wake up call, it was a really useful observation for me! I upped the mana cost and made the condition the same but the bonus +1/+0 and haste because it plays with the Mardu theme of attacking/raid, allows for it to trade for two morphs if hasty, and allows for the 2-mana black creature, 3-mana white creature, into this at 4-mana dream curve. You are right that I definitely overcosted this card. I originally had at 7, and said to myself “Only one more and it can make a mirrored pair with Treasure Cruise, let’s do that.” I reduced its cost to 6 mana for the same effect mainly because I would rather be conservative with delve costs since the mechanic is so abusable, particularly in older formats. Also, I intended this to be a “bad card” purposefully, so overcosting it also checks that box. I took your advice on this one and made it a sorcery and removed the milling choice, adding a sacrifice choice. I also changed the template to make it cleaner, although on magic online this card would have a ton of misclicks followed by rage quits haha. I think your point about the raid trigger needing to synergize with the card was spot on. 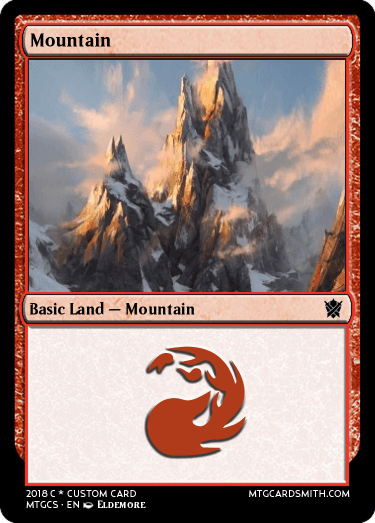 I made the trigger “land freezing”, which has been recently experimented with in red. Because this is relatively punishing, I upped the mana cost to 3. The two previous cards with this effect have been at 4 mana, but I think because this format isn’t friendly to 2 drops coupled with the card not effecting the board means that this is unlikely to get raided too often on turn 3 and as such is acceptable at 3 mana. Same a Battlefury Orc, you made a really good point here. Again, I kept the alternate cost but changed the effect to get back two instants/or sorceries from your graveyard. This plays well with prowess and feels like an effect Jeskai would want. Just a name change here. The name I really wanted was “Unclaimed Territory”, but since that’s taken this was the best I could do. 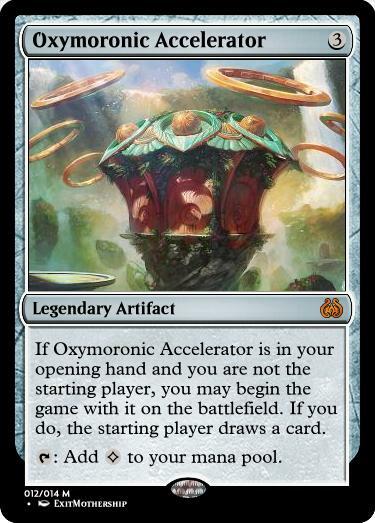 Your comment about only 2 of the 3 “modes” of this card being appealing made sense, so I changed it from an 0/3 to an 0/4. I think the extra point of toughness makes unmorphing it for 2 mana a little more appealing in some situations. Like Vizier’s Venom, I intended this to be a weaker card (both in the pack and in the mono-color cycle that I envisioned it would be a part of), so I am okay with one “mode” being a little weaker. Haha, I put the land in at the last minute and just grabbed the first art I saw. I didn’t even realize there was a dragon in it, thanks for pointing it out! Definitely the most egregious mistake I made.